Another book review that inadvertently disappeared during a site reorganization. Mark Gabriel is not the author's original name. He has not chosen to reveal his original name, both because of possible repercussions to his family in Egypt, and also because of his definite break with his former life. Gabriel was born in Egypt, had memorized the Qur'an by age twelve, and studied at Al-Azhar University in Cairo. Unfortunately, he expressed a doubt about Islam, and was fired by the university and questioned by the secret police. This started a turn of events that led to Gabriel fleeing Egypt and becoming a Christian. He attempted to make contact with the Coptic Christians of Egypt, but they turned him away for fear that he was a spy. 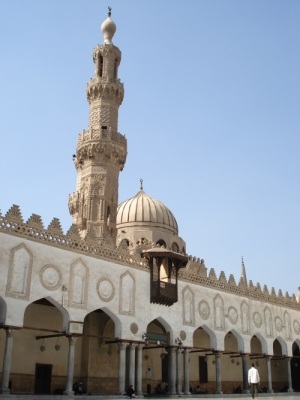 It remains a crime under Shari'a law to seek converts from Islam, so the Copts' fears are understandable. He traveled to South Africa, and from there to America. The brunt of this book is to explain the anti-Semitism he feels is pervasive in Islam. His personal hatred of Jews began with Egypt's humiliation in the Six Day War, but was fed by the popular anti-Semitic suras in the Qur'an, such as sura 5:60, "those (Jews) who incurred the Curse of Allah and His Wrath, and those of whom (some) He transformed into monkeys and swine." Lest this seem to be proof-texting, Gabriel devotes a section of the book to Quranic interpretation. It is perfectly true that the Qur'an contains passages praising the Jews as well as condemning them. The keys to understanding the Qur'an are the doctrine of abrogation, and the hadith. Taking the latter first, the hadith are the words and deeds of Muhammad, as passed down by tradition. There are six compilations of these, with al-Bukhari's the most authoritative in the Sunni world. These compilations purport to trace the sayings directly back to Muhammad, from whence they derive their authority. Thus the historical record is particularly important, since it provides the warrant for using the hadith as a guide to daily life. The doctrine of abrogation is the method by which Islamic scholars reconcile apparently contradictory statements in the Qur'an, which being the Word of Allah, is by definition free from error. The method by which this is done is later verses abrogate earlier verses. Thus an early statement praising the Jews, such as sura 2:47, "O Children of Israel! Remember My Favour which I bestowed upon you and I preferred you to the 'Alamin [mankind and djinn (of your time period, in the past)]. ", is abrogated by a later one, such as sura 5:78 "Those among the Children of Israel who disbelieved were cursed by the tongue of Dawud (David) and Isa(Jesus), son of Maryam (Mary). That was because they disobeyed (Allah and his messengers) and were ever transgressing beyond bounds." Thus again, history is very important because the temporal sequence of the suras is critical to their interpretation. The suras are organized according to length, so knowing which is earlier and which is later is the object of much study. Gabriel provides background on the early history of Islam to explain why the peaceful verses are considered earlier, and thus abrogated by the later verses of the sword. A pivotal event was the point at which the Jews of Arabia began to mock Muhammad, and he turned on them with vengeance. This history is part of the cultural environment in which Gabriel grew up, and thus he continued to hate Jews even after he became a Christian. In addition to this historical and theological perspective, this book is one man's personal contrition for hatred, as he explains how he came to shed his anti-Semitism. This casts a personal light on the otherwise grand, impersonal narratives that Gabriel uses to explain the enmity he felt for Jews. Overall, an interesting book, although occasionally challenging due to the the author's non-native English syntax. This limits the book simply because the author cannot express subtleties well. This book is brutally honest, and as such probably not the best work for dialogue. Should be taken as evidence only of the interpretation of Islam that Gabriel studied at al-Azhar University, but valuable for that.